New Livestock SA president Joe Keynes. KEYNETON livestock producer Joe Keynes has been appointed president of Livestock SA, replacing former leader Geoff Power. Mr Power retired from the role at the Growing SA Conference and Livestock SA AGM last month. Mr Keyne believes a strong Livestock SA is needed to advocate to government and industry for future policy development and investment in programs that support agriculture. “While livestock producers are currently enjoying the most buoyant of times, there is a range of issues vital to their continued profitability and sustainability that we will continue to pursue. 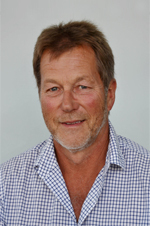 “Livestock SA must remain a relevant and strong industry representative body through policy and industry development and I am looking forward to stepping into this role and contributing to this outcome,” he said. “We’re pleased to have been able to welcome three new members to the board, Mark Dennis, Gillian Fennell and Kate McLachlan. “We have widespread representation across the board with an excellent mix of experience from different regions within SA and a good mix of genders, experience and age,” he said. Mr Keynes said he was also looking forward to working closely with newly-appointed vice-president Penny Schulz. New member Gillian Fennell has stepped into the recently vacated position of treasurer. Mr Keynes was the organisation’s vice-president and has had a long involvement in regional and state organisations including the Natural Resources Management Council and the SA Murray-Darling Basin NRM Board. He has also been a member of LambEx 2014 Committee and is the Livestock SA representative on WoolProducers Australia.